If you want to start a blog, your fear of facing the tech can get in the way. Tech stuff can be daunting. Tech-blog-stuff can be extra scary, especially if you’re just starting out. This guide will get you how to start a blog – it’s filled with tons of screenshots and step-by-step instructions to help you along the way. Unlike this ultimate guide I wrote on starting a profitable WordPress blog here, this tutorial is to get newbie bloggers confident in the behind-the-scenes tech parts to WordPress and beginner blogging. 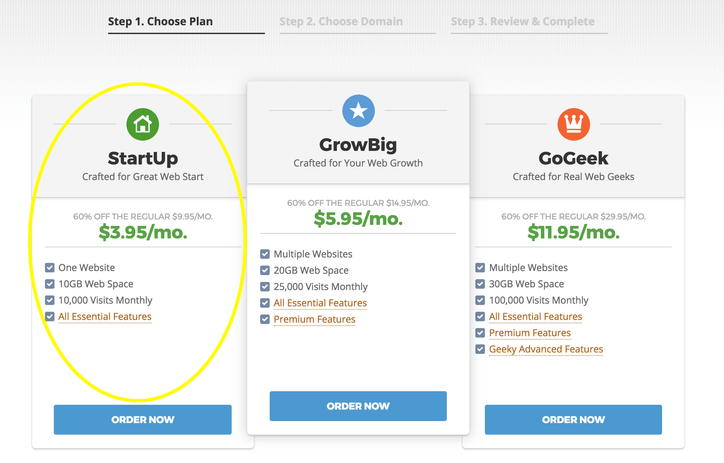 These first four steps will take you 30 minutes to finish (buying your domain, purchasing your hosting, installing your WordPress blog, and connecting your domain name). 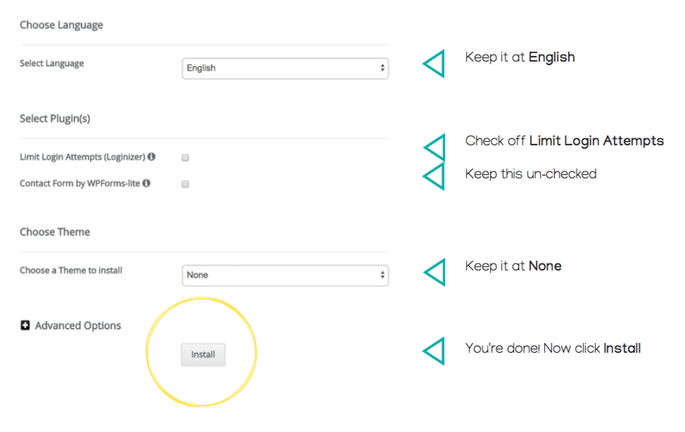 The last three steps are bonus steps you can go through if you want to learn how to install an awesome theme for your WordPress site, set up a blog email account, and install a SSL certificate (I highly recommend you go through these last few steps even though they’re bonuses). Let’s start with Step 1: buying your domain name. If you have a domain name you bought already to use for your blog, congrats! You can skip this step. If you haven’t named your blog yet or bought a domain name, keep reading. For the purposes of this tutorial, I want to focus more on the tech parts of starting a WordPress blog – installing WordPress, customizing it, and making sure you’ve got a handle on the WordPress backend. That being said, you want to make sure you named your blog and bought your domain name already (like www.unicorncopy.co, for example). You can refer to my post here for tips on naming your blog. Once you’ve named your blog, you can purchase your domain name on a site like NameCheap (I recommend NameCheap because it has the best rates for domain names that I’ve seen). After buying your domain name, you can move onto the next step. If a domain name is like an address to your blog, think of web hosting as if it’s the house. Every website needs web hosting to provide the virtual storage space for your blog to “live” in. Beginner bloggers are usually torn between buying a few different web hosting companies. You can read my review of the top three web hosting sites for bloggers here if you want to educate yourself more. I still recommend SiteGround because of their unicorn-like customer service and super fast site-loading speeds. I’ve never had to install my own SSL certificates after I’ve been with them, and they fixed one of my sites in, like, a hot second. If you go through the web hosting site review I mentioned before, then you’ll see that SiteGround has the lowest up-front cost compared to Bluehost and Host Gator. This is another reason I recommend SiteGround to bloggers who are just starting out. In this blog post, I’ll show you how to install WordPress through SiteGround because that’s the hosting I have. 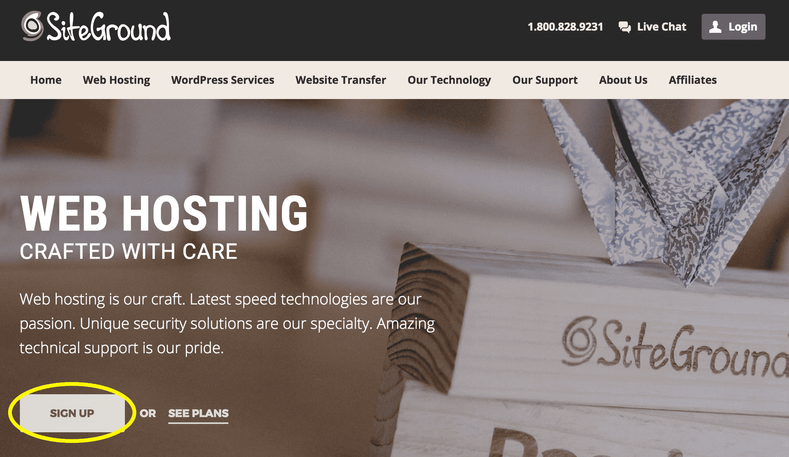 If you end up going with another web hosting option, the tutorial will look different for you (at least during the WordPress installation part). Click the “Sign Up” button you see on the home page. Then, choose a plan for your site. Because your site is new, your traffic won’t be high from the start. That means you need the most basic plan that can accommodate the least monthly visits to your blog. If you need to upgrade your plan, you’ll have the opportunity to do so when your site traffic grows. 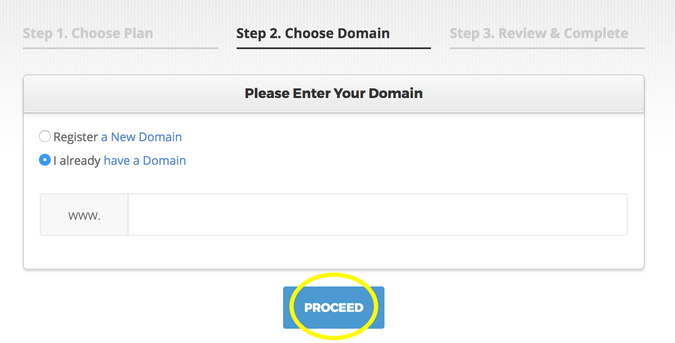 Next, SiteGround will redirect you to a new page where you have to choose your domain. Click “I already have a Domain” (because you bought it from NameCheap already), and enter your domain name in the space they give you. Next, you’ll end up at the final checkout page where you enter your email and password and billing info. Make sure you put down an email you use and a password you’ll remember (this will be your log-in info). At the bottom of your checkout page, it’ll have a section called “Extra Services.” You want to leave that unchecked – you don’t need SG Site Scanner. Once you fill out all your billing details, you’ll click a button on the bottom to confirm your payment. You’re done purchasing your hosting. You’re ready to move on to the next step, which is to install WordPress onto your site. Let’s go back to our house analogy. A domain name is like the house address. Web hosting is like the physical house. That makes WordPress the internal structure of the house. If you think of a website as nothing but a collection of different pieces of content stitched together, then WordPress is what provides that framework – the structure – for that content. It’s what allows you to manage the content on your site in an organized way, plain and simple. Good news is that mostly all web hosting sites know the needs of bloggers and online entrepreneurs, so they come with their own WordPress autoinstallers. In just a few clicks, you can install WordPress onto your site through SiteGround and call it a day. It’s that simple. Just follow these steps to make sure you install it the right way. First, you want to log into your SiteGround dashboard. 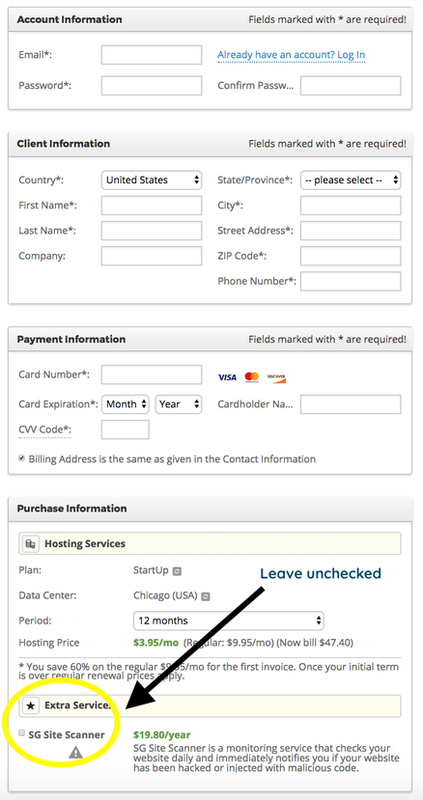 Use those login details you set aside when you bought SiteGround in Step 2. You’ll end up in your control panel (“cPanel”) as shown in the screenshot below. Click on the “Install Now” button as shown in the screenshot above. This can be overwhelming when you’re starting out. That’s why I created a visual guide so you enter the right info for each section. Just follow the visual guide below, and you’re golden. Once you’ve clicked “Install,” you’re done! You’ll see a progress bar that goes to 100% once the installation is complete (this takes under 30 seconds). At this point, you’ll see a screen that tells you your installation was successful. You’re ready to move on to the final step of your 30-minute WordPress blog installation. Because I’m really feelin’ this house analogy, let’s go back to it. Your domain name is the house address. Your web hosting is the house. WordPress is the internal structure of the house. See, your house address is associated with your physical house because that’s the number that’s written on the house (simply put). At this point, though, your domain (your address) isn’t associated, or “pointing to” your web hosting (your house)…yet. We need to associate your domain name and your web host and get them “talking” for your site to run. This happens whenever you buy your domain name from a marketplace other than the one on your web hosting. In this case, we bought ours on NameCheap. Right now, our domain name is pointing to NameCheap’s servers. We want to change that and get the domain name pointing to SiteGround’s servers (don’t worry, this part is really painless even though it sounds super technical!). Log into your NameCheap account (you created it when you bought the domain name from there). Here, you want to find the domain name you purchased for your blog. You’ll see that right now, the nameserver is set to “Namecheap BasicDNS.” This means that your domain name is pointing to NameCheap’s servers. Remember, we want it to point to SiteGround’s instead. You’ll see two empty spaces for you to copy-paste SiteGround’s server names. You can find SiteGround’s server names in your cPanel of your account. In another tab, log into SiteGround and click on My Accounts >> go to cPanel. 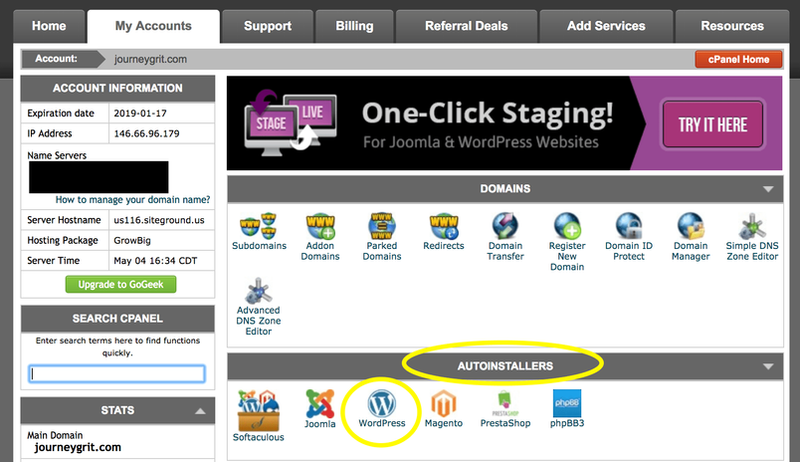 You’ll end up in the cPanel like you did when you were installing WordPress. Copy the first nameserver name. Repeat the same process for Siteground’s second nameserver. Important: After you’re done copy-pasting both nameservers, make sure to click the check mark in the top right of the nameserver section (highlighted yellow), otherwise your nameserver change won’t save. Now you’ll just have to give your domain 6-24 hours to finish “pointing to” your SiteGround servers. You’ll be able to access your WordPress blog at that point using the WordPress log-in info you put down when you installed WordPress. 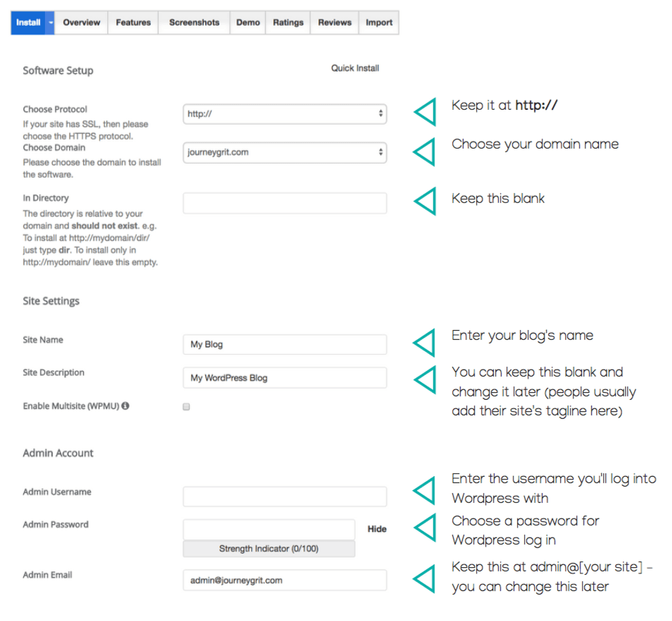 This will lead you directly to the WordPress log-in page for your site. Congratulations on getting all the tech stuff out of the way! You’re done setting up the bare minimum for your WordPress blog in just 30 minutes. 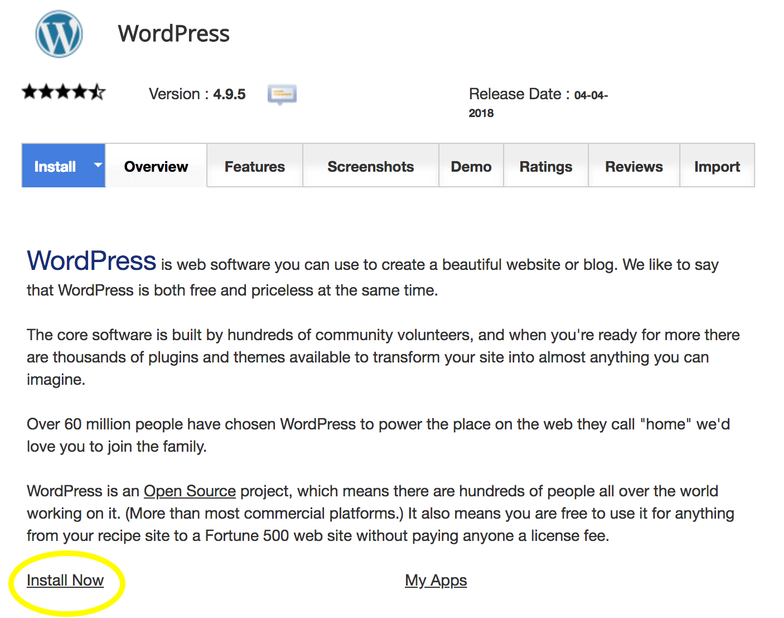 If you want to keep getting the hang of WordPress, keep reading for the bonus steps. A WordPress theme is like the painting on the walls of the house – the decorations, the small details, the fixtures. A WordPress theme allows you to customize the look and feel of your site. Good WordPress themes allow you to have a lot of freedom with your design and layout customization. There are many free WordPress themes you can use. I recommend the following: Illdy theme, Nisarg theme, or the Lovecraft theme. However, if you want a WordPress theme with a lot of design freedom and customizability, then I’ll always point you in the direct of the Divi theme. 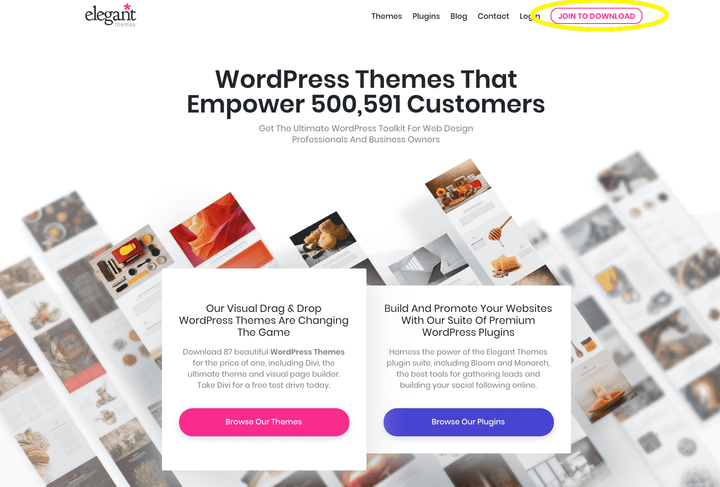 Elegant Themes is the company that sells Divi. You can create free landing pages for your lead magnets with Divi, and customize entirely your home and about pages all by using a really intuitive drag-and-drop builder. I’ve seriously never had so much fun designing websites. Other drag-and-drop builders don’t pass the fun-and-functional test because they’re so clunky to use and have too many useless features. Divi is drag-and-drop based, so you can play around with your design until it looks just right. I make all my websites on Divi. The good news is that once you buy the Divi license ($89), you can install this on multiple websites. 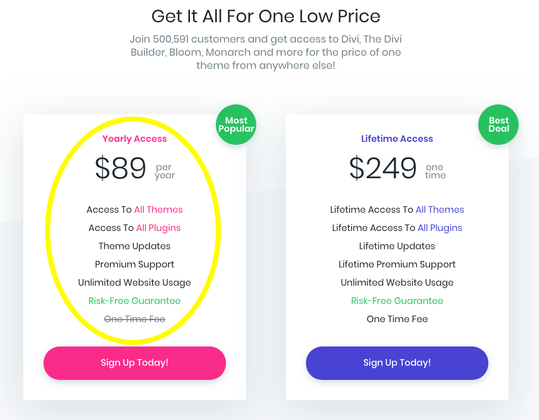 If you’re ever creating another website or blog in the future, or maybe looking to do work for clients, then all you need to do is purchase Divi once and you can install it on unlimited sites. Once you’re in your dashboard, download the Divi theme and Divi Builder. Divi is the theme and the Divi Builder is the plugin that allows you to use the drag-and-drop builder. You’ll download these as .zip files – you don’t need to open them up! I’ll show you what to do next. This makes the Divi theme go live on your WordPress blog. Next, you want to install the Divi Builder plugin. It’s the same sequence of events you followed for installing the Divi theme, except you’re doing it in the Plugins section now. 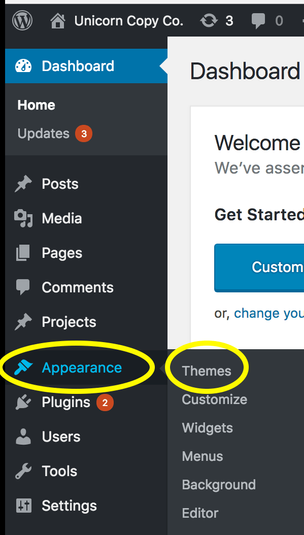 Head to the “Plugins“ section in the left-hand side of your WordPress dashboard (“Plugins” is right under “Appearance”). 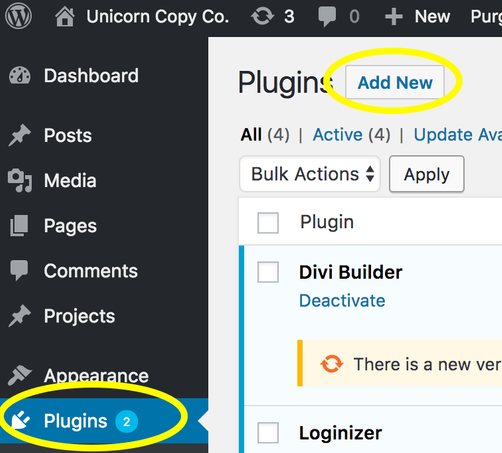 Then, click on “Add New” and install the Divi Builder the same way you did the Divi theme (simply by uploading the .zip file for the Divi Builder). You’re done installing the Divi theme. You can now customize all your pages in really unique ways that suit your brand. By the way, if you want an entire lesson on branding, join my free 5-day Blogging Biz Bootcamp, a challenge that’ll show you how to brainstorm, brand, and launch your profitable blog idea. You’ve done the launching now, but if you want some branding pointers, it wouldn’t hurt to sign up for the challenge and keep and eye out for the last email of the Bootcamp. Sign up for the Blogging Biz Bootcamp below! It’s important to have a gmail and a blog mail account that’s just dedicated to your new blog. First, create a gmail account that’s just dedicated to your blog. I recommend gmail just because it’s so easy to use. Once that’s done, you’ll set up a separate domain email for your blog on SiteGround. This is the email address that looks like this: alex [at] unicorncopy [dot] co.
You need this kind of domain email because some affiliate programs later on (and even your email service provider for your blog) will want an “official” email to prove you are the site owner. That’s why it’s important for you to make one – and it’s really easy to do, too. Head over to the SiteGround. Log in, then access your cPanel (My Accounts >> go to cPanel). I like to use my first name for the “Email” section. You can also use the word ‘admin,’ too. Enter a password. Keep in mind, this is the password to log into your email account on SiteGround (it can be the same one you use for your SiteGround login, or whatever password is easy for you to remember). These are just different applications to view your SiteGround email account. You can choose any of them. I just always go with horde because it’s first (that’s a good reason, right?). Ta-da! You have access to the webmail of your email account now. Now, it’s kind of a pain to get access to this email account because you always have to go through SiteGround, amirite? You can set up a forwarder to forward your domain emails to your regular gmail address. This makes it easy for you to receive all your domain emails in one place. This is also easy to set up. Go back to your cPanel and type in “forwarders” into the search bar on the left. Your domain emails now will be forwarded automatically to your regular gmail address so that you never miss the important things getting sent to your domain address. SSL certificates are the norm these days. They’re what allow a secure connection between a browser and a web server. They’re also what produce the “https” protocol at the start of a website. All the tech stuff aside, why do SSL certificates matter for bloggers? They matter because without them, your site’s authority looks pretty bad to visitors. Effective July 2018, in fact, Google Chrome will mark “http” sites as non-secure. That means visitors will get notified they’re at risk whenever they try to visit your site. Big no-no. It just turns people away. Because they’re the standard, SSL certificates are free in some plans. Thankfully, that’s SSL certificates are free with SiteGround. 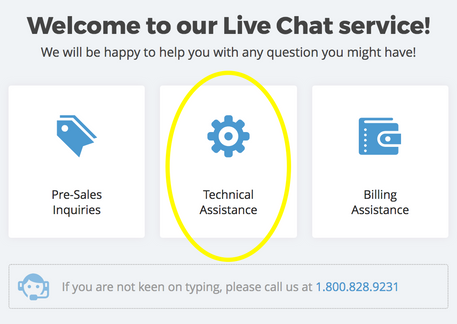 There’s a way to install them yourself through the dashboard, but I quickly learned SiteGround’s amazing customer service reps will just do it for you. 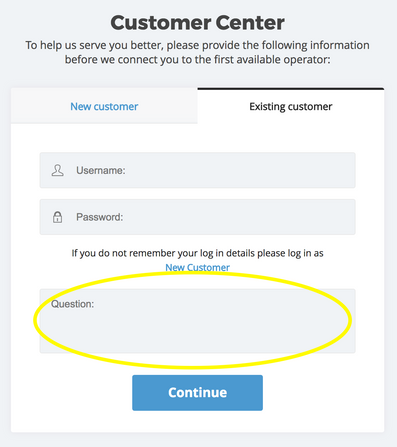 Just enter your login details and in the “Question:” section, let customer service know that you need help installing an SSL certificate onto your domain (name the domain). You’ll probably wait a few minutes before you get onto a chat with a rep. This takes around 5 minutes in total – super easy. The customer service rep just installs the SSL certificate for you (it’s not much effort any way, but this takes away the guesswork for you on whether you installed it correctly). Once the installation is done, you’re done! Nothing else you need to do. You’ll notice in a few hours your website will have the “https” protocol instead of the “http” protocol. It’ll also have that really satisfying green padlock right next to the name. Come on. You know that padlock makes you feel good about your site (I guess that’s the purpose behind it, eh?). Cheers to making your visitors and Google feel very happy about your website! I know that was a pretty long guide. But I’m proud of you for sticking it through. You’ve handled quite a bit of the tech stuff that goes into making and running a blog already. Was the tech stuff the most daunting thing to you when the inspiration hit to start a blog? If not, what was it then? In the mean time, why don’t you sign up for Blogging Biz Bootcamp, my 5-day challenge that’ll show you how to brainstorm, brand, and launch your profitable blog idea? You’ve handled the “launch” and “set up” phases already, but it wouldn’t hurt to look into the makings of a profitable blog niche or pointers on how to brand your blog, both of which the challenge teaches you to do. Sign up for the free challenge below!